1 x single rod of Boro Gold Ruby measuring 7mm dia x 490mm long. Finally, a rich Gold Ruby colour has been developed for the borosilicate palette! 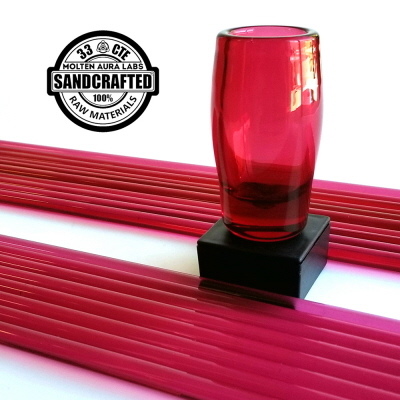 Rods may be various shades of pink, but will self-strike to a gorgeous cranberry hue in the flame. This GemTone™ is buttery smooth to work, and will not over strike. Solid colour blow-outs are highly recommended to fully appreciate the clarity and saturation of this Museum-Quality glass.